This is a recipe I picked up from Better Homes & Garden. Putting butter on the cookie sheets worked like a miracle. The peanut brittle came off so easily that it came off as one piece…lifted right out. I also have to say, for not measuring the baking soda, just sprinkling it over the mixture, it still came out beautiful. This is definitely a keeper. Butter 2 large baking sheets; set aside. Butter sides of a heavy 3-quart saucepan. In pan combine sugar, corn syrup, water, and butter. Cook and stir over medium-high heat until mixture boils. Clip a candy thermometer to side of pan. Reduce heat to medium-low; continue boiling at a moderate, steady rate, stirring occasionally, until the thermometer registers 275 degrees F, soft-crack stage (about 30 minutes). 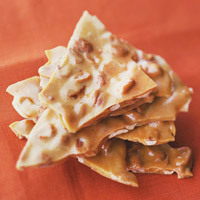 Stir in nuts; continue cooking over medium-low heat, stirring frequently, until thermometer registers 295 degrees F, hard crack stage (15 to 20 minutes more). Remove pan from heat; remove thermometer. Quickly sprinkle baking soda over mixture, stirring constantly. Immediately pour onto prepared baking sheets. Use 2 forks to lift and pull candy as it cools. Cool completely; break into pieces. Store tightly covered up to 1 month. What about removing the logo from the original publishers image and using it on your site with the recipe. Is that copyright violation? I would caution against using any images unless you have permission to do so.